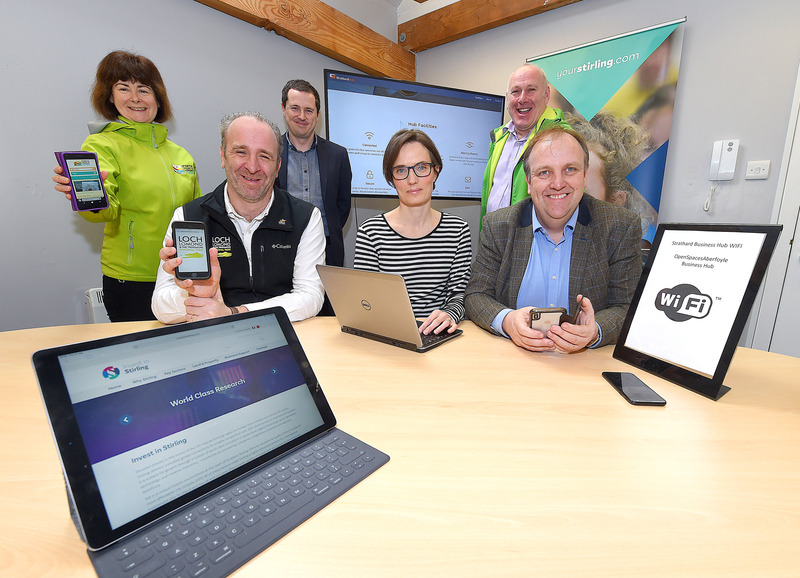 Aberfoyle has become the latest rural community in Stirling to benefit from vastly improved connectivity after its free town centre Wi-Fi went live – in a boost to local businesses, residents and visitors. Stirling Council worked in partnership with Strathard Development Trust to deliver the project, supplying them with funding of £21,850 and supporting them throughout the process. The introduction of the free superfast internet access is expected to stimulate economic growth and increase tourism in Aberfoyle, which is located inside the Lomond & Trossachs National Park. By helping the public and businesses connect to information and people, it will increase the amount of time spent by visitors in this beautiful part of Stirling. Without the obstacle of international roaming charges, it will also make it easier for tourists to share their experiences on mobile devices. Local businesses including Aberfoyle Bike Hire, Outlaw Escape Rooms, Strathard Business Hub, Liz McGregor's Coffee Shop, Trossachs Motor Company, Difference Corporation and The Forth Inn all backed the scheme. The technology is centred at the recently-opened Strathard Business Hub which is operated by the community trust. Trevor Geraghty, Chair of Strathard Community Council, said: “Now that Aberfoyle is connected with free WiFi it means locals and visitors can get online 24/7, which is ideal for checking bookings, buying online, reserving accommodation, checking job boards, along with a range of other benefits. “Overseas visitors will be able to get connected without running the risk of mobile roaming charges, while the Wi-Fi portal will also allow analysis of visitor and user numbers, greatly assisting in planning the kind of services the community requires. “This is the forerunner to making Aberfoyle and Strathard a truly digital community with plans for gigabit connections and 5G on the horizon. The Council is supporting projects in communities across the area to develop alternative broadband solutions, with £300,000 of annual capital funding invested in the scheme. One Full Time Equivalent Rural Broadband Project Officer, supported by the Council and the Forth Valley and Lomond LEADER programme, is in place until March 2020, to provide technical, project and funding support to communities. Cllr Margaret Brisley, Convener of Stirling Council’s Finance and Economy Committee said: “Securing access to fast and reliable Wi-Fi will be transformational for Aberfoyle, supporting economic growth and ensuring the town remains a top tourist hub. Along with Aberfoyle’s free Wi-Fi initiative, three other innovative broadband projects have gone live across rural Stirling - Balquhidder, Argarty & Kilbryde, and Stockiemuir – while two other areas, The Trossachs and Carron Valley, are out to tender. Elsewhere, Blairlogie, Gartness and Auchinteck are at design stage, while nine locations - Ardeonaig, Arnprior, Crainlarich, East Loch Lomond, Fintry, Kinlochard, Stronachlacher and Tyndrum - are exploring solutions. (back, from left) Anne-Michelle Ketteridge, Programme Manager, Forth Valley and Lomond LEADER; Steven MacDonald, Stirling Council Economic Development Team Leader; Shaun Marley, Stirling Council Broadband Advisor; (front, from left) Gordon Watson, Chief Executive of Loch Lomond & The Trossachs National Park Authority; Katinka Dalglish, Head of Strathard Community Trust; Trevor Geraghty, Chair of Strathard Community Council.